Many transboundary water basins around the world are facing climate-related challenges that will intensify in the decades to come. Successful adaptation will be an important precondition for ensuring sustainable development and political stability in these basins. At the same time, stability and cooperation are preconditions for successful adaptation. How can riparians best achieve these interrelated objectives? And with the international community seeking to support both processes, how can water and climate diplomacy strengthen each other? This report* outlines key water governance instruments that support climate change adaptation in trans- boundary basins. An increasing number of river basins use such instruments, for example data and information sharing mechanisms or flexible water treaties, to address the impacts of climate change and build adaptive capacities. Yet, this report also shows that in many basins such instruments are not employed at all or only to a limited extent. In identifying existing shortcomings, the report asks how such weaknesses could potentially be ameliorated by climate policy instruments. This report further illustrates that the impacts of climate change are not only a threat to socio-economic development but can also contribute to (re-)emerging conflicts in transboundary river basins. It is therefore important to build capacities to adapt to climate change and increase resilience in internationally shared water basins to strengthen environmental protection, economic and social development as well as regional political stability. *download available from the right-hand column of this page. An overview of the contents of the report and summary of the recommendations are provided below. See the report for much more detail and case study examples. From page 7 of the report: Shipwreck in the Dried-up Aral Sea by Milosz Maslanka / shutterstock.com. The report provides several case study examples, including on Water AllocatIon Under CondItIons of Climate Change in the Ural Sea. Climate policy provides a number of tools, including vulnerability assessments and adaptation planning, that could further strengthen adaptation in transboundary basins, especially if they were applied at basin scale. Moreover, international climate finance can provide much-needed additional resources for adaptation activities. If well designed, these tools can also generate co-benefits by building trust between riparians over shared challenges and identifying mutually beneficial opportunities for managing change and uncertainty. However, achieving such synergies needs mutual cognizance and proactive engagement of the water and climate communities, in order to harness existing experiences and to transfer them to the transboundary level. support riparian states in establishing new basin institutions and strengthening existing ones by ensuring the integration of governance mechanisms that help dealing with change (such as flexibility mechanisms, dispute resolution provisions or standards for transboundary environmental impact assessments). Further potential entry points for closer and more integrated cooperation, at the national, regional and international level, are provided on pages 25 and 26 of the report. From page 10 of the report: Senqu River behind Mohale Dam in Lesotho by Sabine Blumstein. The report provides several case study examples, including on Improving the Knowledge Base on ClImate Change in Onorange-Senqu RIver. The climate diplomacy initiative is a collaborative effort of the Federal Foreign Office in partnership with adelphi, a leading Berlin-based think tank for applied research, policy analysis and consultancy on global change issues. This publication by adelphi research gemeinnützige GmbH is supported by a grant from the German Federal Foreign Office. 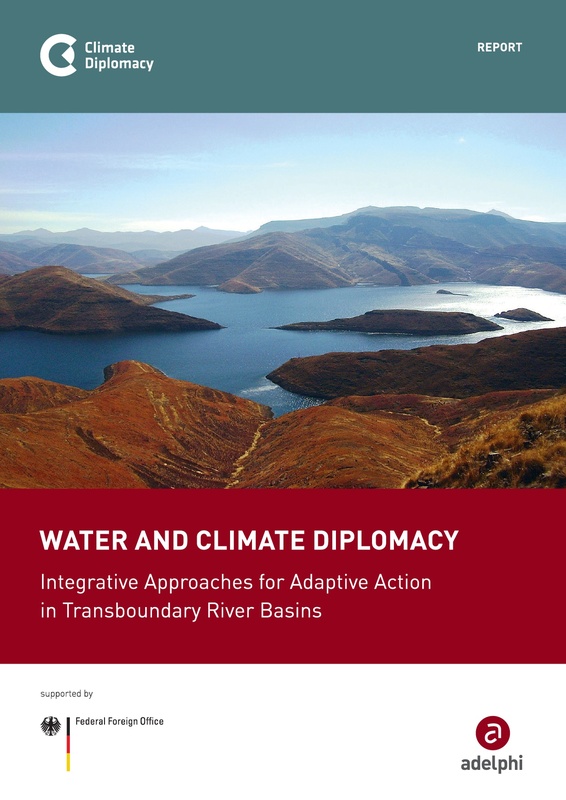 Blumstein, S.*, Pohl, B. and Tänzler, D. (2016) Water and Climate Diplomacy – Integrative Approaches for Adaptive Action in Transboundary River Basins. Climate Diplomacy report. Adelphi: Berlin, Germany.